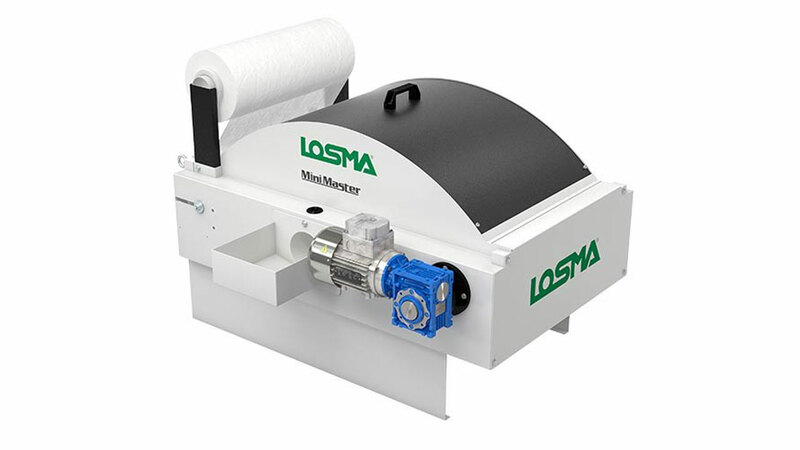 Master is a range of high efficiency gravity filters, using non-woven fabric as filter media. 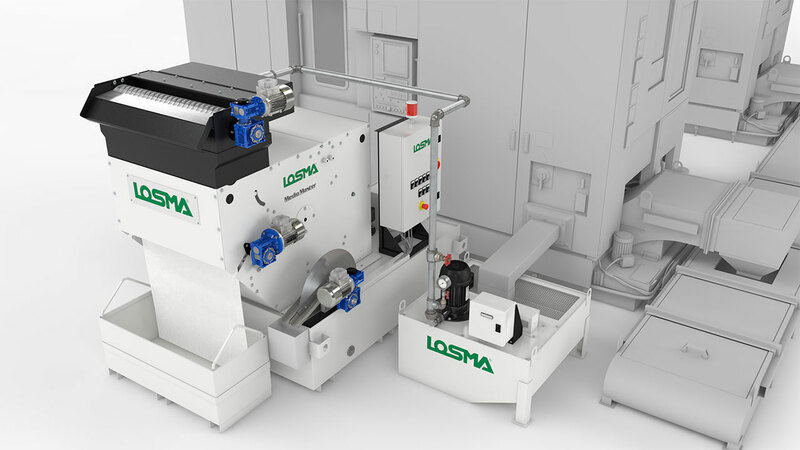 LOSMA guarantees that every single unit is individually tested through strict control procedures. Each unit is issued a test certificate for quality and function. Compared to flatbed filters of the same capacity, dimensions are significantly smaller and can achieve greater levels of filtration. Compared to flatbed filters, gravity beds use less fabric and have a better efficiency. 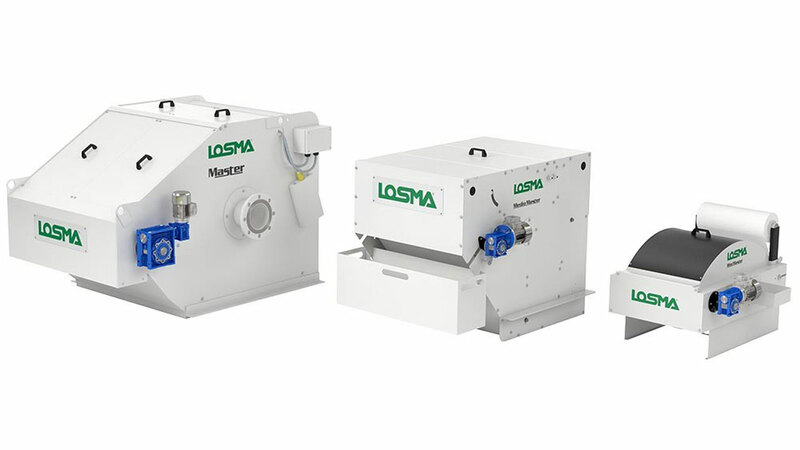 Master series is available in 4 models, able to manage flowrates from 200 to 1000 l/min of neat oil and from 400 to 2000 l/min of water based emulsion, contaminated by magnetic or non-magnetic particles. 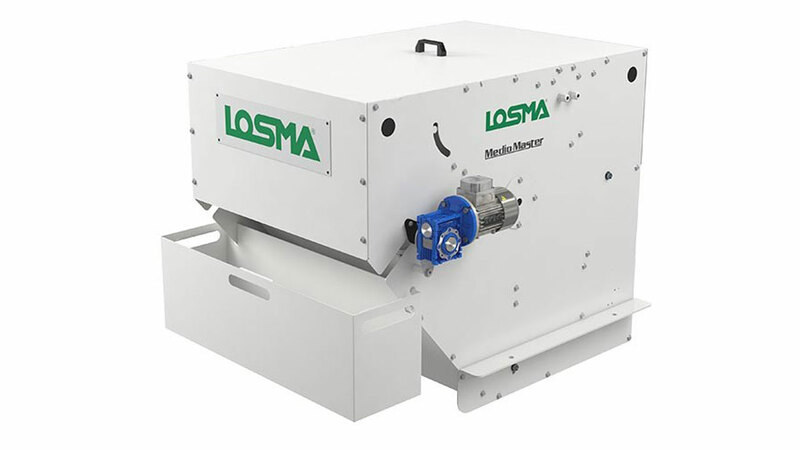 Medio Master is available in 3 models, able to manage flowrates from 200 to 400 l/min of neat oil and from 400 to 800 l/min of water based emulsion, contaminated by magnetic or non-magnetic particles. 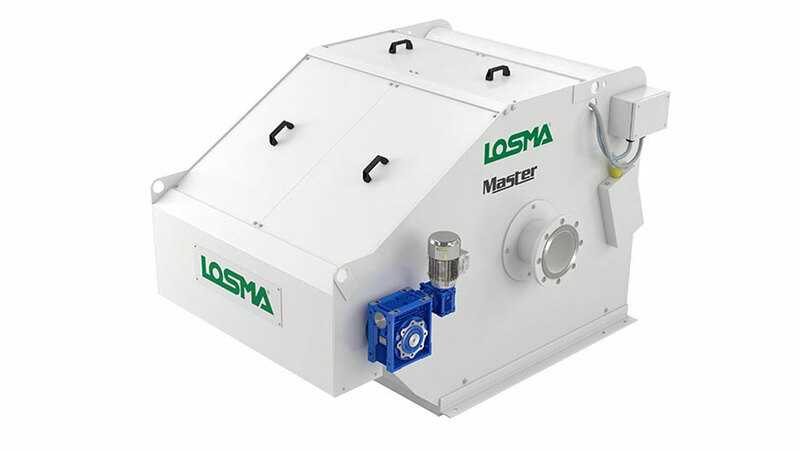 Mini Master is available in 3 models, able to manage flowrates from 60 to 200 l/min of neat oil and from 100 to 400 l/min of water based emulsion, contaminated by magnetic or non-magnetic particles. The filtering fabric (A), stretched inside the filter, is perfectly clean. The dirty liquid enters in the system and has to pass through it to go to the lower tank, thus depositing pollutant particles on its surface. 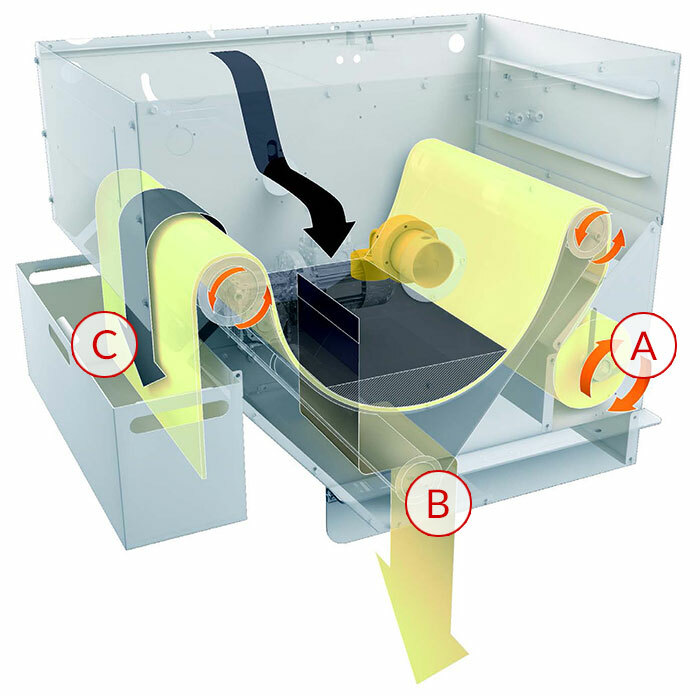 The clean liquid goes through the lower part where the discharge opening (B) is located and falls into the tank underneath. During this phase the system is idle and the fabric is not advancing; pollutant which is deposited on the filter fabric forms the actual filtering layer, which in many applications can reach a thickness of 10 mm. The dirty filter fabric permeably is reduced, because the dirty liquid continues to deposit the pollutant onto its surface, and the coolant level starts increasing. The filtration degree improves due to the thickness of the mud deposited on the filter fabric. During this phase the system idle. The liquid has reached its maximum level, at this stage the best possible filtration degree is actually reached. The longer the filter operates in this conditions, the better the average filtration will be. The system is idle also in this phase. When the fabric is totally obstructed and the liquid cannot pass through it anymore, the regeneration cycle begins. Motor reducer allow the system to rotate and moves the dirty filter fabric (C), while the clean one is introduced and permeability restored, allowing for the level to descend and return to intermediate condition 2. Superficial oil skimmer, it allows to lengthen coolant quality and eliminate odors generated by anaerobic bacteria. 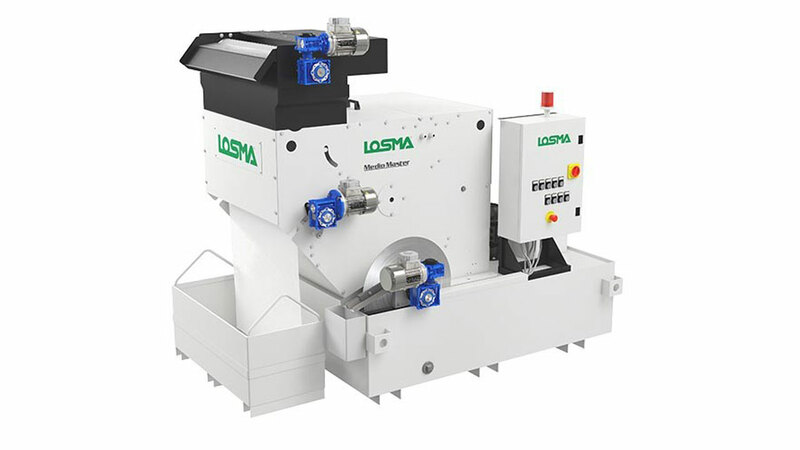 Pre-filtration system with rotating magnetic discs for the separation of magnetic polluting particles from coolant. For powering the system, control and command all signals. For clean liquid to be sent back to machine tool. To collect dirty liquid for feeding the filter. 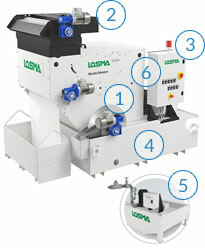 For pressure from 0,1 to 100 bar for returning clean liquid. Personal data transmitted with the form will be used only from LOSMA SPA and its subsidiaries in accordance to the Privacy Law 196/03, for sending information about the activities. The cancellation can be requested by sending an email.